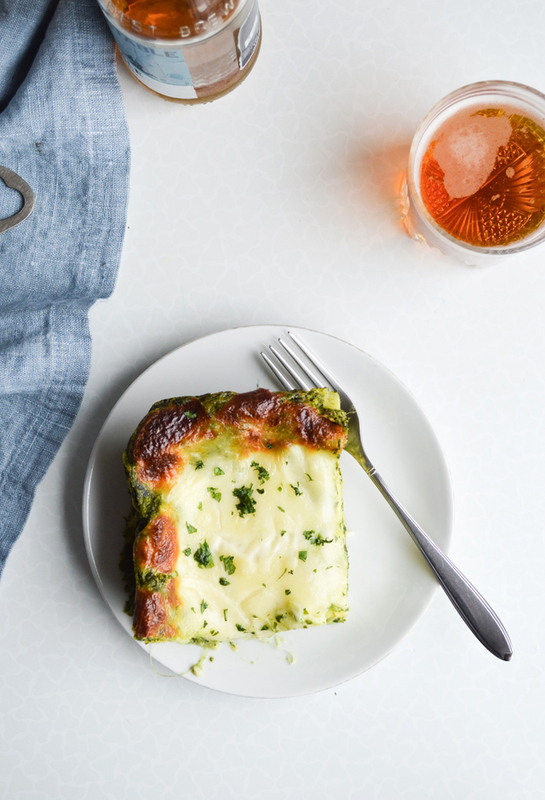 Make this Easy creamed spinach lasagna and everyone will love you. Promise! I can’t believe I’m about to write this, but … the holidays are just around the corner! If you’re giving me the side-eye because of that statement I don’t blame you, I’m giving myself one too. It is October 13th, way too soon to be thinking about the holidays, but I’m telling you they’re almost here. They’re hiding somewhere between all the pumpkins and Halloween decor, the cold and my refusal to wear a winter coat. I’ll turn around one day and it’ll be December. The stores tend to hurry with this and I sometimes wonder when we’ll start seeing Christmas decor in August, but so far so good, nothing’s out yet. Whether you completely love the holidays or hate them, or you like some parts but get annoyed by the rest, whatever the case, I think we can all agree on something. Holiday food is the cat’s pajamas! A funny saying, but so fitting. Just imagine the holidays without all the food. Not as fun, right? And so I wanted to share a favorite with you, one you can master before the holidays. The perfect cold weather dinner. Great for a crowd or just for you, as it reheats beautifully. It’s my easy creamed spinach lasagna and it’s amazing. It takes some time to make, but I do think it’s a fairly easy meal to put together. The best thing about lasagna is that it stays hot forever if you keep it in the dish, and even longer if you decide to keep it in the oven set to a very low temperature (or even turned off – right after baking). This gives you enough time to leisurely get to the dinner table, there’s no “serve immediately” instruction attached to it and therefore no stress at all. 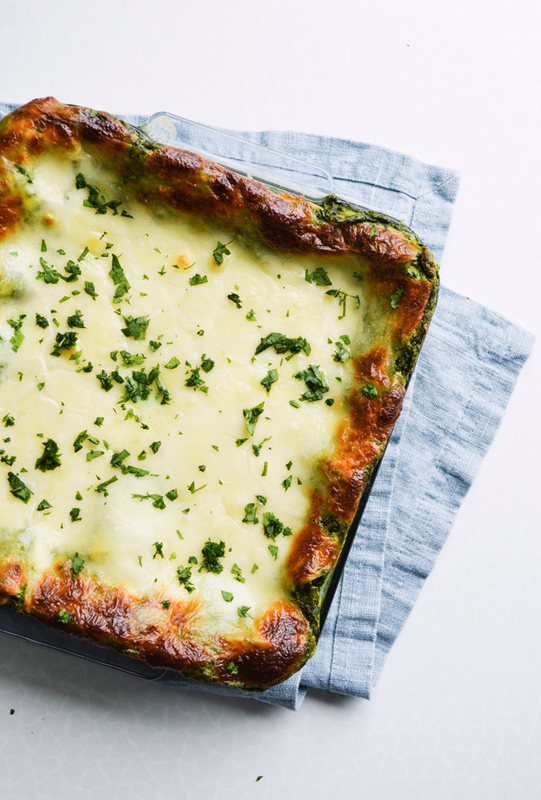 This is basically a spinach version of a classic lasagna. 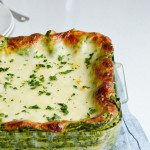 It’s a wonderful combination of lasagna sheets, classic béchamel sauce, a thinned out version of this creamed spinach and mozzarella on top. Also, the thinner creamed spinach is also really good if you serve it with some gnocchi and Parmesan cheese. 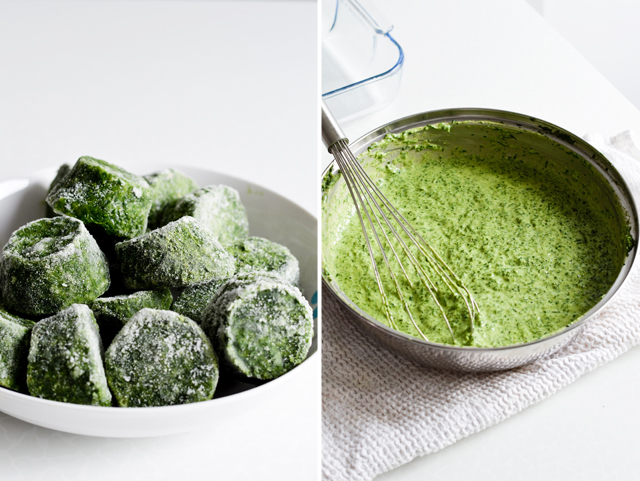 I use frozen spinach in this recipe, which is my absolute favorite thing to have in the freezer at all times, right next to ice and ice cream. It’s an absolute staple and you’ll see why with this easy recipe. 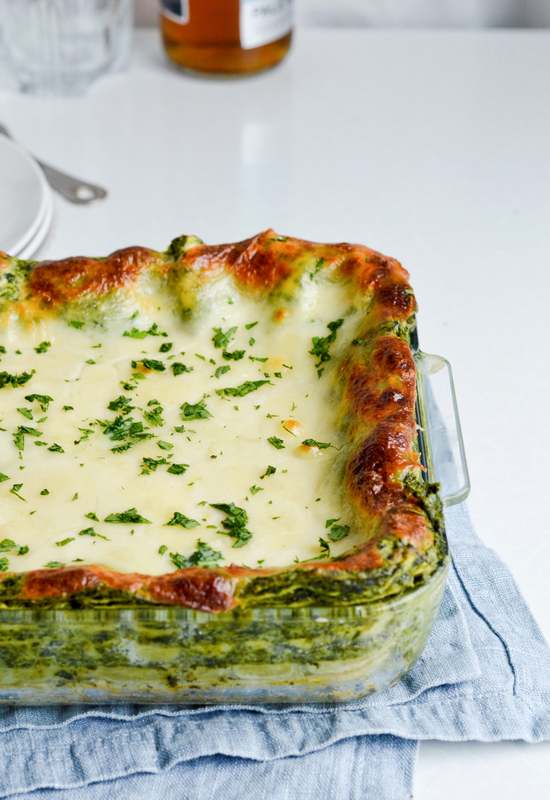 A hearty creamed spinach lasagna, perfect for any season. Recipe makes one 12×12 inch (30×30 cm) lasagna, that comfortably serves 4 (or even 6) people. Preheat the oven to 200°C (392°F) and lightly grease a 12-inch (30-cm) square baking dish with oil. Set aside. In a skillet, heat the oil over medium heat. Once hot, add the flour and whisk fast (to prevent flour form burning). This will form a floury paste. Quickly add the spinach (don’t drain it) and whisk until incorporated. Then add the egg and continue whisking for about 3-5 minutes until the spinach is hot and egg cooked. Add the garlic powder, sour cream and milk, whisk until incorporated and cook for a few more minutes, stirring occasionally. Add a teaspoon of salt, then taste to see if you need more. Set aside. Place a large pot of salted water on the stove and bring it to a boil, then set aside. In a small saucepan, set over medium heat, melt the butter. Immediately add the flour and whisk until you get a smooth paste. 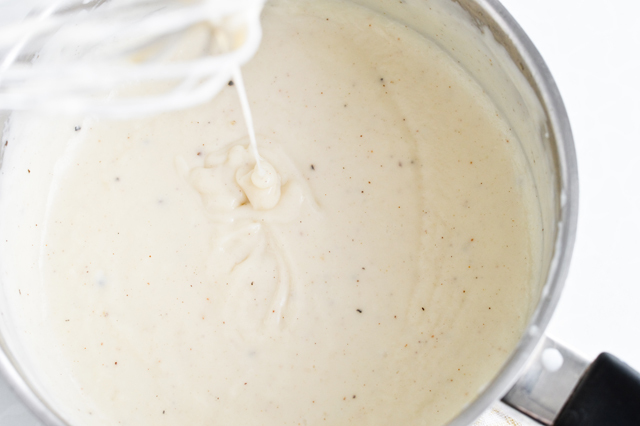 Let the béchamel cook for about 3-5 minutes, keep on stirring. Season with salt, nutmeg and few grinds of black pepper. Once the sauce thickens a bit, set it aside and start preparing the lasagna. 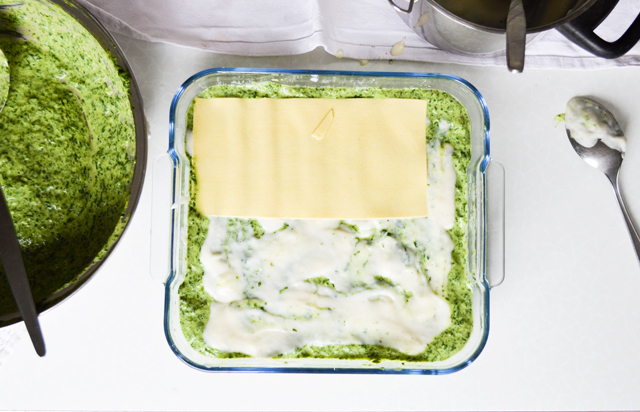 Top with about a ladle of spinach sauce, gently spread it all over pasta, then add 2-3 tablespoons of béchamel. Top with 4 more sheets of pasta and continue in this manner until you run out of the sauces. The last layer usually has the least amount of sauce, this is the layer you sprinkle with cheese. 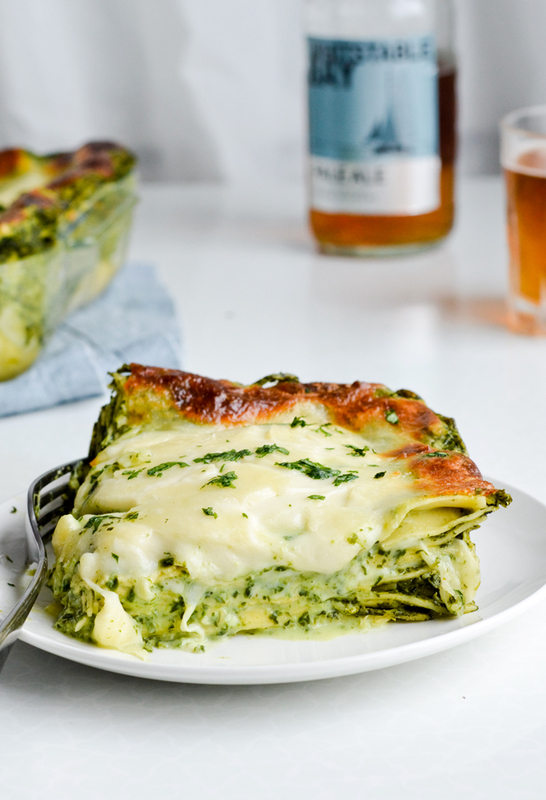 Bake the lasagna for about 30 minutes or more, until the cheese is completely melted, even golden brown in some places, and bubbly. Remove lasagna from the oven and sprinkle with parsley. Let lasagna sit for at least 10 minutes before serving. I use the oven-ready pasta sheets that don’t require precooking. You can fully cook these if you wish, but I don’t think it’s necessary. What I prefer to do is dip them in a pot of boiled water. If I’m making this vegetarian lasagna bolognese, I don’t dip them for long because the tomato sauce gives pasta enough liquid too cook in when in the oven. When I make the spinach lasagna, which is made of a thicker spinach sauce, I like to soak them for at least a minute. It’s perfectly okay if they’re in the water longer than that as you’re busy assembling the lasagna. This lasagna has 4 pasta layers, made with 20 pasta sheets. Each layer is made of 2 1/2 sheets placed in vertically + another 2 1/2 sheets placed on top horizontally. 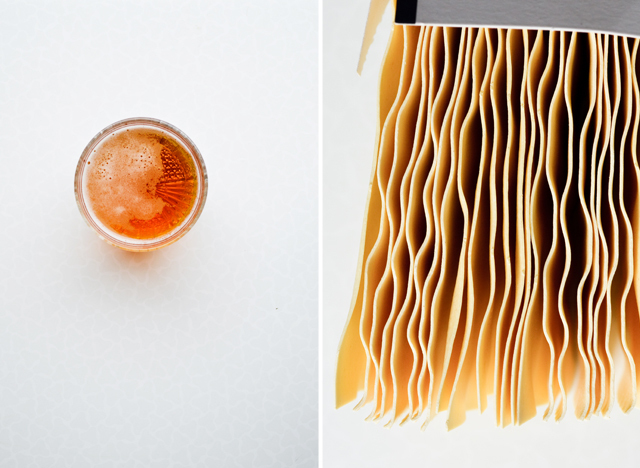 Adjust the amount of pasta sheets you use if your dish is bigger or smaller. To keep lasagna warm, cover it with aluminum foil until you are ready to serve. You can even put it back in the oven (turned off). The easiest way to reheat the lasagna is in the microwave, reheat each serving separately. Alternately, you can reheat the whole lasagna (in the baking dish) in the oven set to 200°C (392°F), just keep it covered with aluminum foil or a lid. If you’re in the mood for something extra comforting, add a dollop of sour cream to each serving of lasagna. I wish my roommate would love spinach as much as I do. Unfortunately she hates it. But maybe I can convince her to try it again. And if she still refuses to eat it I’ve got more for myself. That shouldn’t be a problem at all, because this lasagna look delicious! I have family that is allergic to eggs. Is there a substitution? Or can I just leave it out of the recipe? Hi Mili! Yes, you can easily leave out the egg, no substitution needed (you can add an extra tablespoon of sour cream if you wish). 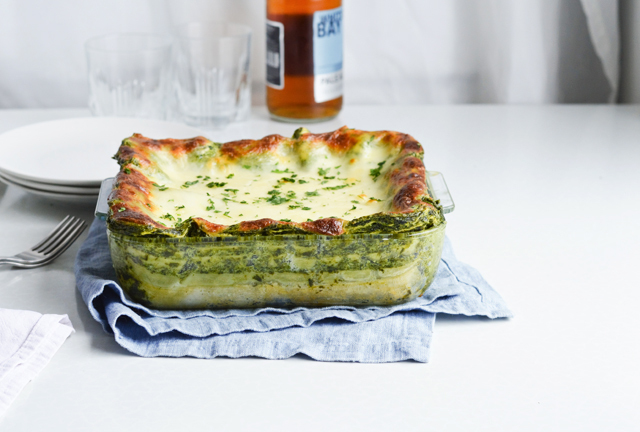 It won’t affect the taste all that much or the texture, because you still have bechamel to top the spinach with. Also make sure the pasta you use is egg free as well. OMG I have this in the oven now. I tasted some of the scraps of spinach and bechsmel swiped onto leftover pasta and it was amazing. I can hardly wait for it to be finished, because it can only get better…if that’s even possible! Thank you so much for sharing! So happy to hear that Julie, thanks for telling me! 🙂 Hope you enjoyed your dinner. UPDATE: It got a 10/10 from my husband and very picky 14 yo daughter–they both asked for leftovers as their lunch today! Wow, that’s awesome. 🙂 I’m glad they loved it and thanks for making my day, Julie! I made this last night for the bf and I. I cook a decent amount. I make some good stuff. THIS though…he went on and on about it. I just had some for breakfast and it was even better. Once I got mise en place, it was really simple to make. I also appreciate that it didn’t call for ricotta as that shaved off about $5 and we all know lasagna can be a pricey dish to serve. It’s going to be my new go to meatless dish. Thank you so much for this recipe. Thanks for sharing this with me, Alyssa! 🙂 Totally made my day and I’m so happy you guys love it. I made this last night for a family dinner and everyone raved. My 10 year old is extremely picky and she scored it a 9. Her friend who “hates spinach” tried it and gave it a 7, lol. I heated it up today and it was equally delicious. Will make again. It makes me happy to see you guys enjoyed it. Thank you for sharing, Deanna!